PrecisionCraft designs and crafts luxury homes around the world, and has been doing so since 1990. What you may not realize, however, is that there are specific regions around the globe that naturally attract a PrecisionCraft residence. Our ongoing Spotlight on Luxury series seeks to assist your understanding of these special areas and to provide insights into why you may wish to consider one of these locations for your next luxury home. Did you miss Puget Sound? Click here. Need to catch-up on Colorado? Click here. While the Blue Ridge Mountains are considered a physiographic province of the Appalachian Mountains, they have a singular identity, both in their geographic make-up and in the hearts of those familiar with their unique look. With two national parks within their borders, Shenandoah National Park and the Great Smoky Mountains National Park, it is likely that the Blue Ridge Mountains are what you picture when thinking of America’s storied Appalachian Range. Known for their characteristic mist and distinctive blue color, the Blue Ridge Mountains rest amid the central Appalachian ranges. 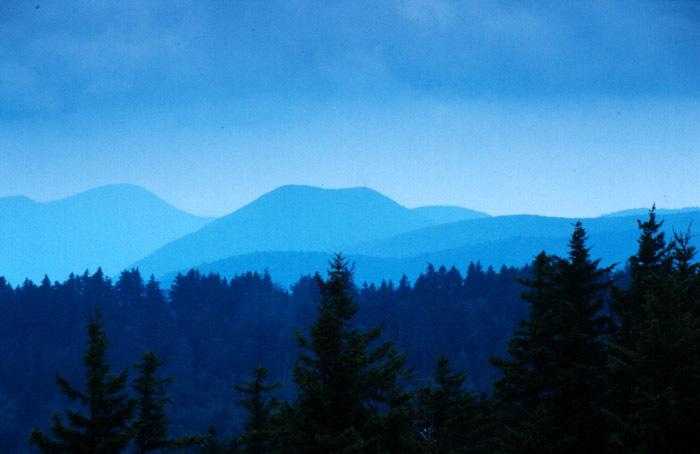 In fact, the tallest mountains in eastern America are in the Blue Ridge range. 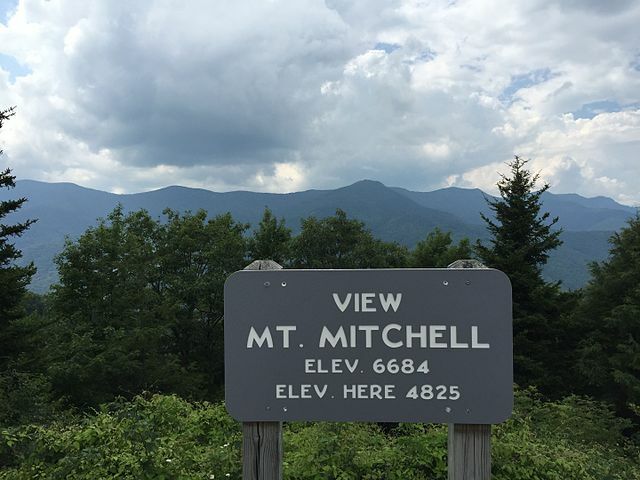 Indeed, it is the range’s beautiful Mount Mitchell and its 6,684 foot (2,037 meters) elevation that claims title to the tallest peak in the entire Appalachian chain. 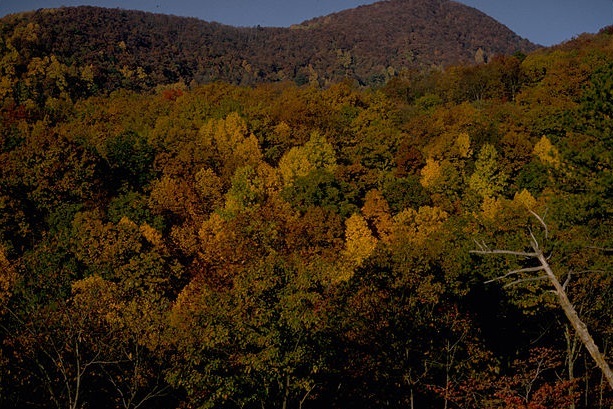 In addition to its famous mountain tops and enormous swaths of protected, park land, the Blue Ridge Mountains also offer a milder, mountain climate. The range actually has no alpine zone, allowing even its highest peaks to adorn themselves in a lovely, dense, vegetation, including spruce and fir forests in the southern stretch, and oak and hickory forests farther north. These mountains are home to the world’s most botanically rich mixture of temperate climate plants outside of Asia. Combined with the close proximity to several cities, including Charlotte and Asheville in North Carolina and Knoxville, Tennessee, and it is easy to understand why so many PrecisionCraft homes are located here. In fact, past clients have shared with us that it is the area’s beautiful blend of city, climate, and countryside which first attracted them to building in the Blue Ridge range. Why Build In The Blue Ridge Mountains? Walking, hiking, and climbing are big activities in the Blue Ridge Mountains. The Scottish tradition known as peak bagging arrived here much earlier than in other parts of America. For those a tad less daring, fly fishing in one of the many, stocked, streams and rivers (ii) can be (literally) a stone’s throw away from your front entry. And, if you choose to instead indulge in shopping, art, or fine dining, the Blue Ridge Parkway (iii) provides access to Roanoke, Virginia; Asheville, North Carolina; and many other vibrant metropolitan areas. The Great Smoky Mountains National Park, a UNESCO World Heritage Site, straddles the ridgeline of these mountains, teeming with well-preserved historical attractions. And, because of its large footprint, building your luxury home in the Blue Ridge Mountains means you have many states in which to build. What Should You Build In The Blue Ridge Mountains? Based on our in-house architectural design team’s concept, the award-winning, luxury home below is a Blue Ridge Mountain residence of elegance and warmth. 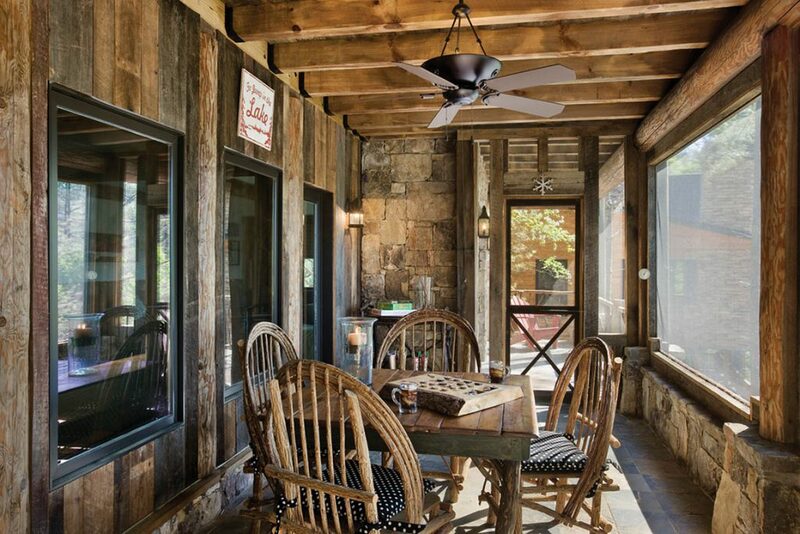 This home mixes handcrafted logs and post and beam construction with heavy stone and reclaimed barn wood accents. Each of these building elements was studiously selected so as to perfectly reflect the home’s rustic Georgia location. PrecisionCraft’s handcrafted post and beam homes provide you an alternative to the more traditional full log wall construction. You enjoy the authenticity and beauty of our signature, massive, logs while still easily incorporating stone, shake, weathered siding, painted walls, and stucco into your home. Should you prefer your Blue Ridge residence be constructed using something other than logs, be certain to visit the Timber Frame Homes page of our website. If you are considering this legendary mountain range for your luxury home, you may wish to register for one of John’s Home Planning Seminars. Click here. From rounded, rolling hills to the mighty Mount Mitchell, the Blue Ridge Mountains offer views and flora galore. 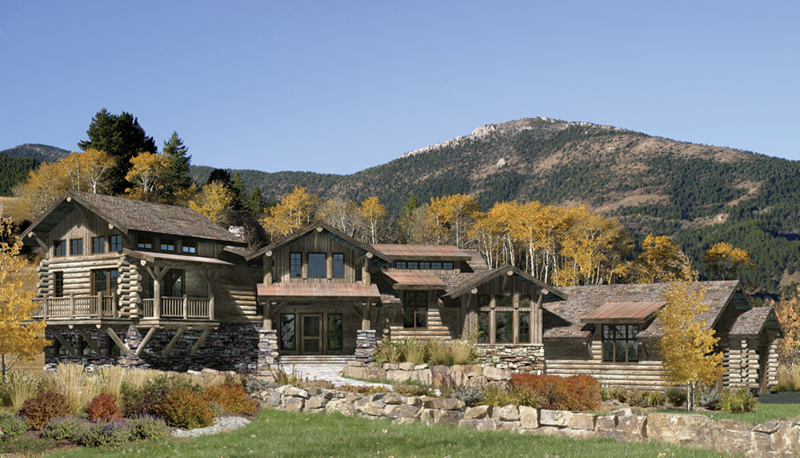 With a milder mountain clime than ranges to the west, your luxury log, timber, or hybrid home is accessible almost year-round. And, with PrecisionCraft’s white glove service, your Blue Ridge mountain retreat is just a turn of the key away. Please visit our blog in two weeks when we write about how to define a log cabin. (ii) Native brook, brown, and rainbow trout thrive in the many stocked streams of the mountains. (iii) The Blue Ridge Parkway is often closed during the winter months though access to metropolitan areas is still possible.